W 90” | D 30.5” | H 52” | ARM H 25"
INSIDE W 71" | SEAT D 22.5" | SEAT H 18"
RAZZLE "SKY" WITH SELF-WELT, SELF-BUTTONS, BROWN TACKS & DARK WALNUT LEGS. You love your Carter sofa like the late Johnny Cash loved his talented queen, June Carter. It'd be damn near impossible to get the Jukebox Blues on this perky Carter Sofa. 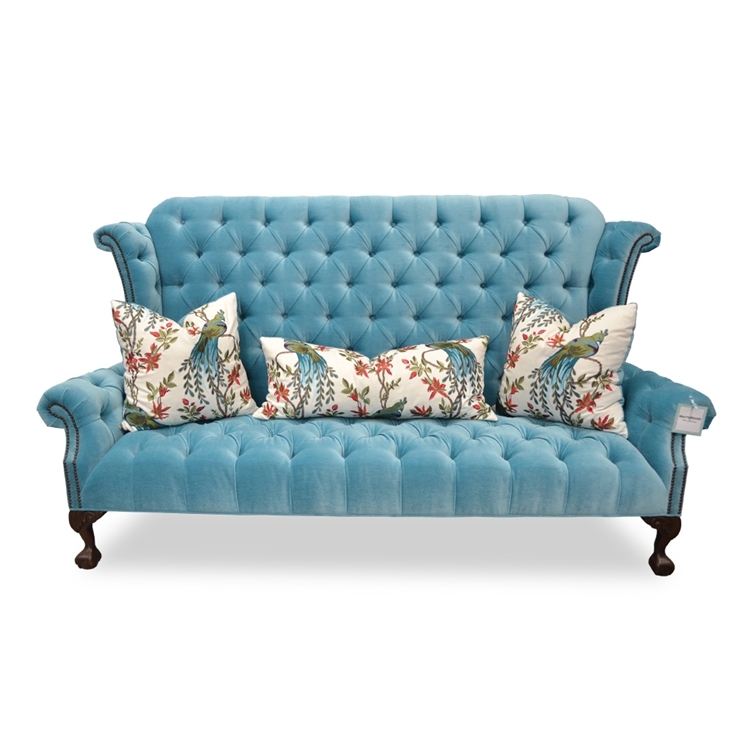 The rolled arms, tufted upholstery and tall back are both inviting and invigorating. This piece is priced with a Grade C Haute House Home fabric, not in the fabric shown as it has been discontinued. Sofa comes with (2) square accent pillows shown. Boxed weight is approximately 295 lbs. Email info@hautehousehome.com or call 323.256.2800 for custom options.